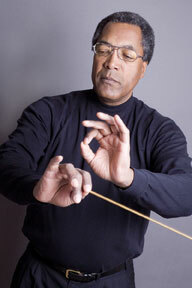 Anthony Elliott conducts a symphony orchestra. Anthony Elliott, Conductor of the Michigan Youth Orchestra at the University of Michigan, is in continuous demand as a conductor, and as a concert cellist. Equally at home with the bow or the baton, he has earned numerous awards, enthusiastic public acclaim, and excellent critical notices for his performances throughout the United States, Canada, Europe, and Asia.